Enter main doors and sign in with BSS Security, please. Park on circular drive or on nearby streets. Note: A Beginner-friendly and scent-free group. There is plenty of parking. We dance in Room 122. This is a beginner friendly class. All levels of skill and experience are welcome. We teach steps and formations early in the evening. Enter annex of western-most building [lower level entrance on right] and go downstairs to the gym. Contact: Gillian Clinton Instructor: Blair Gerrie 416.651-8933 Beginners are welcome. Instructor/Contact: Blair Gerrie 416.651-8933 Beginners are welcome. Beginner friendly; all levels welcome. 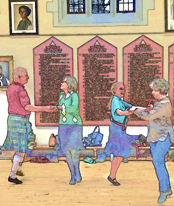 Spring Dance: St. Andrew’s Presbyterian Church, 44 Church Street E., Brampton <map>. Dancing begins at 7:30pm. Cost: $5 per night or $100 if paid in advance on September 13. Those paying in advance get a FREE vest or shirt with the HDSCD logo on it. Cost $5 We stop for afternoon tea and dancers take turns bringing treats. Wear shoes to suit a vinyl floor. (Look for the square turret; NOT the pointy spire church) Driveway beside church leads to a carpark at rear. Rosedale Presbyterian Church, 129 Mount Pleasant Rd at South Drive <map>. New students, boys or girls, are always welcome. 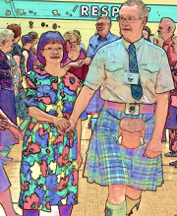 Come and enjoy social dancing, festivals, parties, special events and gala days. 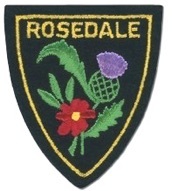 A Scottish social group. Dances the 3rd Saturday of each month in dance season. Shiftin’ Bobbins ((not-affiliated with RSCDS Toronto -- for Intermediate and Advanced dancers) $35 Season Membership covers all Sunday sessions. If you are not a member, your first visit is free, but thereafter $10 at the door. “Shiftin’Bobbins” meets one Sunday afternoon a month in central Toronto. Each session a different guest MC will feature dances not often seen elsewhere for those already comfortable with the more complex RSCDS formations and able to participate with minimal instruction. Tickets for the Nov 23 St Andrew’s dance are $30.